As part of the ʻĀINA in Schools PDE-3 course, teachers gain access to educational resources both in and outside of the classroom. In addition to curriculum trainings, teachers attend field-trips throughout the year to learn about environmental stewardship, farming, coastal restoration and more. This Spring, educators visited three of ʻĀINA In Schools newest partner sites: Leilehua High School Agriculture Learning Center, Kakoʻo ʻŌiwi, and Sweet Land Farm. Teachers can apply for Kōkua Hawaiʻi Foundation Field Trips Grants to visit these and other amazing sites starting May 1st, 2019 on the Kōkua Hawaiʻi Foundation website. 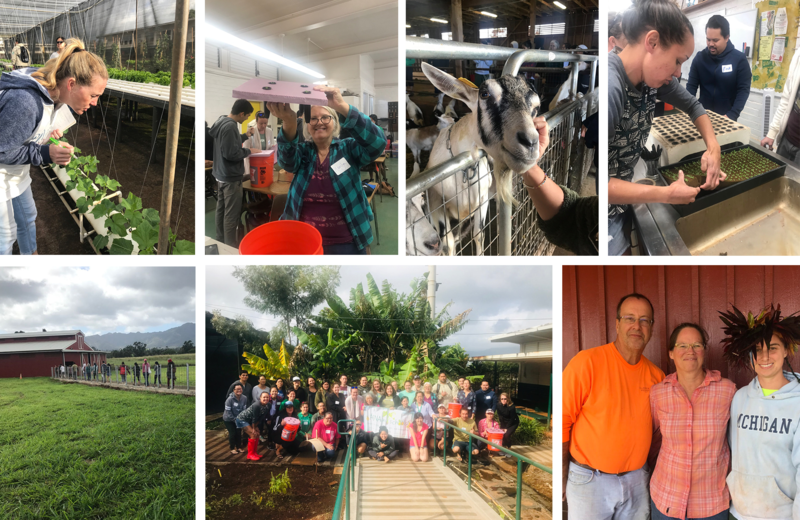 Deep in Wahiawā, tucked in the back of campus, the Leilehua High School Ag Center is a stunning 3-acre area with pathways for students to learn aquaculture, animal husbandry, food production, loʻi kalo, and even welding. Students in the program lead field-trips throughout the year for adults and keiki alike. They also organize activities for keiki visiting the farm, tailoring activities to what students are learning in the classroom. Just over the hill on Kaukonahua road in Waialua is Sweet Land Farm, a family-owned goat cheese dairy run by second generation farmer, Emma Bello. After attending culinary school at Leeward Community College and interning with the Surfing Goat Dairy in Kula, Bello found her passion raising goats and creating delicious cheeses. A truly family-oriented operation, each family member does their part, from growing the alfalfa to feed the goats, to constructing a storefront and visitor center, and even making value-added products like caramel out of farm products. Sweet Land Farm is a great field-trip site for students and adults alike to learn about sustainable animal-husbandry and cheese making. As a bonus, you can also scoop a few (or a lot) of fresh goat chevré or house-aged Tomme straight from the source. A member of the ever-strengthening cohort of environmental stewards in Kanēohe and Heʻeia, Kakoʻo ʻŌiwi lies between partner orgs Papahana Kuaola and Paepae o Heʻeia, representing a continuous ahupuaʻa from mauka to makai. Once dominated by loʻi kalo terraces, the area underwent a long period of pineapple, cane, and subsequently cattle farming. Today, the Kakoʻo Ōiwi team is working to restore loʻi, outplant native food crops, and share the land with ʻohana who wish to grow food and care for the land. With 405 acres under the care of Kakoʻo Ōiwi, the vision to create an agricultural, ecological, and cultural hub with a “mosaic” style approach to production. Visitors to Kakoʻo Ōiwi learn about the moʻolelo of Kanēohe, cultural activities like weaving and building ahu, and getting in the loʻi to learn about kalo production.